Kerrie McLean, Katrina Gaitero, Joan Johnson, Libby Dabbs, Tim Dabbs, Beki Boulet, Prospective Michael Boulet. With the weather forecast at high 30’s and track work between Central and Blacktown it was no surprise that the group number dropped to 7. I hoped this would actually enable us to keep a steady pace and complete the 12km walk by midday to escape the afternoon heat. I also had a back-up plan to retrace some of our steps after morning tea and take a shorter track out which would shorten the walk by 3km. After our introductions we quickly headed off down the Victory track and a steady pace was kept up until morning tea. 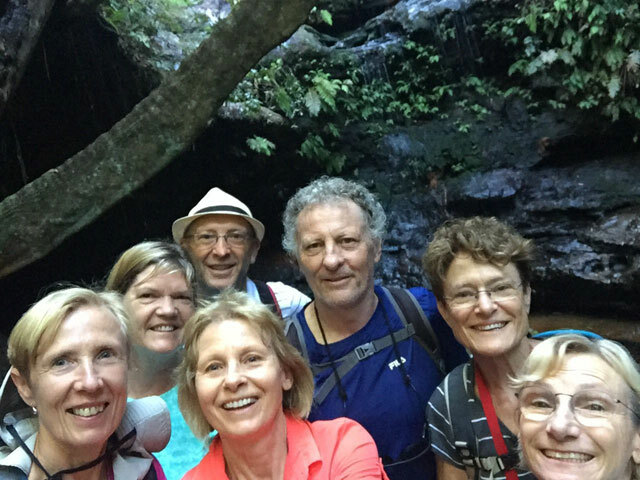 We still managed to have time to enjoy Clarinda Falls and try out our skills with the selfie stick to catch the group photo. 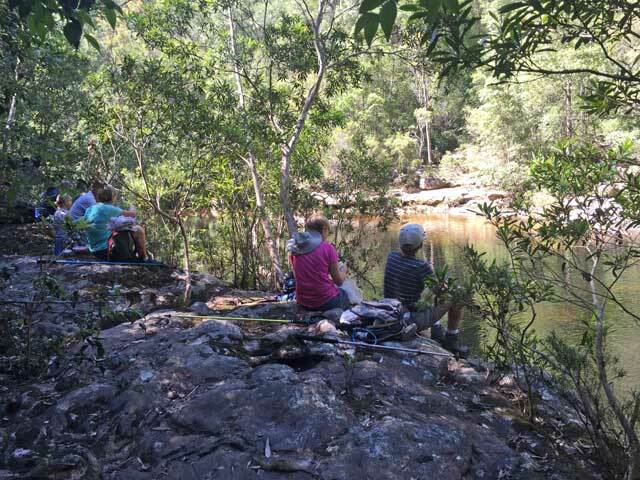 Morning tea was quickly eaten on a rock platform at the creek junction. We all felt confident at this stage that we could finish the original walk in good time. We soon came to Perch Ponds and then headed uphill past Martins Falls and by this time it was starting to warm up so we then kept a slower pace with more drink stops. It was along this section that we were aware of a kookaburra that was tangled in a vine and unable to free itself. With a bit of group effort we managed to untangle and free it. It appeared to not have suffered any injuries but it was definitely in luck that we came along. After much discussion about the bird we headed off again. At the base of the steps near the end of the track we noticed a shaded timber seat so we sat down and decided to have our lunch there except for 2 members who left to catch the train at nearby Springwood station. While we were eating we were entertained by a couple of lyrebirds. This is a mostly shaded walk with typical bush tracks and follows 2 creeks for most of the way. We all agreed it was an enjoyable morning out and that we had a nice group of walkers.